The soft drink firm is set to buy a British coffee chain. The soft drink giant announced their take over plans of Costa Coffee. The deal is to be worth BILLIONS. Coca-Cola are set to purchase Costa Coffee for £3.9BILLION. This will positively affect Costa coffee chains after disappointing 2017 profits for the coffee chain. Costa's 2017 pre-tax profits fell by 10% to £59 million - which is thought to be the increase in the price of coffee imports from abroad. Following disappointing profits, Costa's parent company, Whitbread had intended to spin off the chain as an independent company. However, they found a sale of Costa coffee chains will be more profitable. Costa Coffee has a huge history in the UK, and in the past, has seen rapid growth. You can now find Costa Coffee stores in cities around the UK, smaller coffee shops inside stores in a different sector and you can now find Costa 'on-the-go' machines in shops all around the UK. When Whitbread bought Costa in 1995, Costa only had 39 stores across the UK. Now, Costa is the UK's biggest coffee chain, with 2,400 UK coffee shops, as well as 1,400 outlets in oversea markets. There are also now 8,237 Costa 'on-the-go' vending machines in stores all around the UK. Following the announcement of a takeover, Whitbread's share price went up by a big 16% on Friday afternoon. Costa's main competitor is Starbucks. 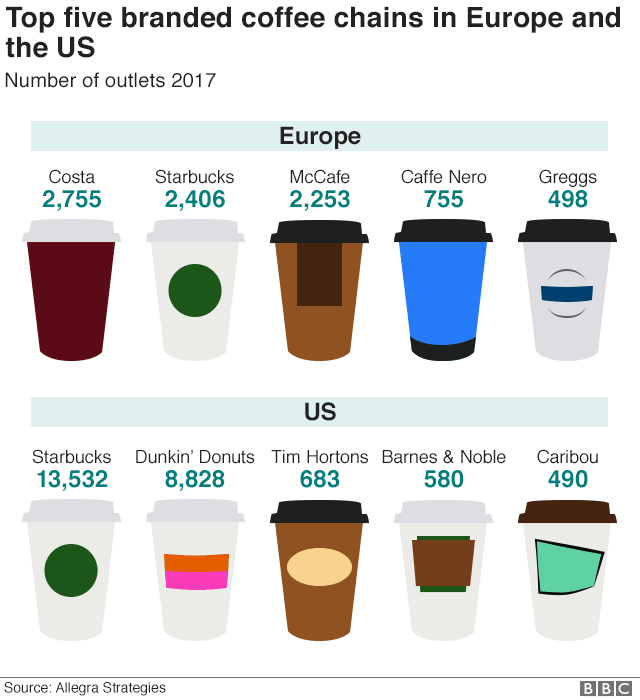 In Europe, Costa actually has more stores than Starbucks does. Costa has 2,755 stores across Europe and Starbucks has 2,406 stores across Europe. Another of Costa's competitors, Cafe Nero, has 755 stores across Europe. In America, it is a different story. Costa currently doesn't operate in the US. Which is a big advantage for their main competitor, Starbucks who have 13,532 stores all across the US.